Pioneers in the industry, we offer diamond wire saw moulding machine, diamond rope wire moulding machine, injection molding machine for diamond wire saw and diamond wire saw coating machine from India. We are offering a wide range of Diamond Wire Saw Moulding Machine. The molding machines offered by us are precisely assembled using high grade components sourced from eth trusted vendors of the industry. These machines are known for quality, reliability and efficient performance. 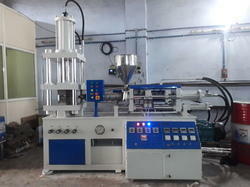 We are offering a wide range of Diamond Rope Wire Moulding Machine. The molding machines offered by us are precisely assembled using high grade components sourced from trusted vendors of the industry. These machines are known for quality, reliability and efficient performance. We are offering a wide range of Injection Molding Machine for Diamond Wire Saw. The molding machines offered by us are precisely assembled using high grade components sourced from eth trusted vendors of the industry. These machines are known for quality, reliability and efficient performance. We are offering a wide range of Diamond Wire Saw Coating Machine. The molding machines offered by us are precisely assembled using high grade components sourced from eth trusted vendors of the industry. These machines are known for quality, reliability and efficient performance. Looking for Diamond Wire Saw Moulding Machine ?